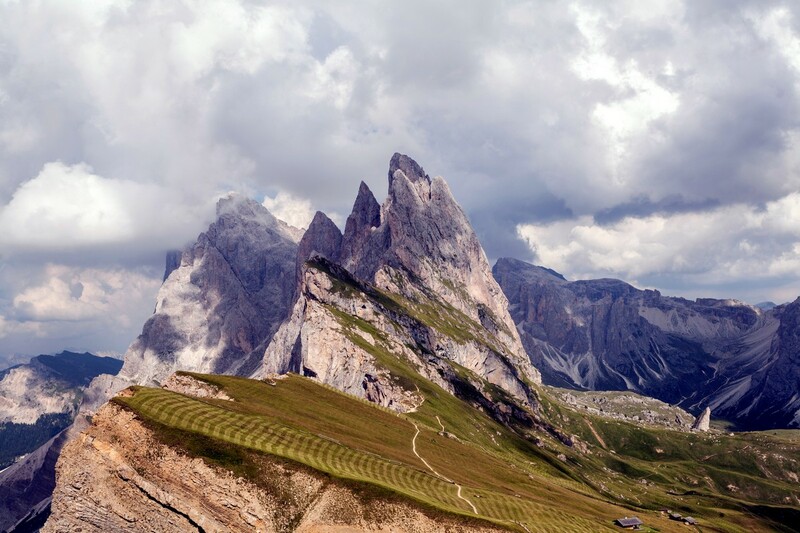 The Italian Dolomites are one of those bucket-list places. Stunning mountains, great hiking, beautiful food and a vacation steeped in La Dolce Vita. A few days in the Dolomites is never enough. Below are our tips to plan your holiday to the Dolomites. 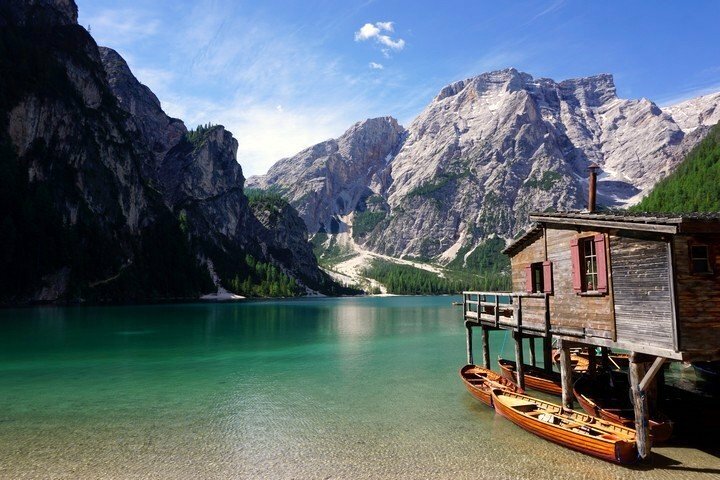 Etched high in the skyline of the northern Italian Alps, bounded by rolling green valleys, turquoise lakes, and spectacular glaciers you’ll find the Italian Dolomites. 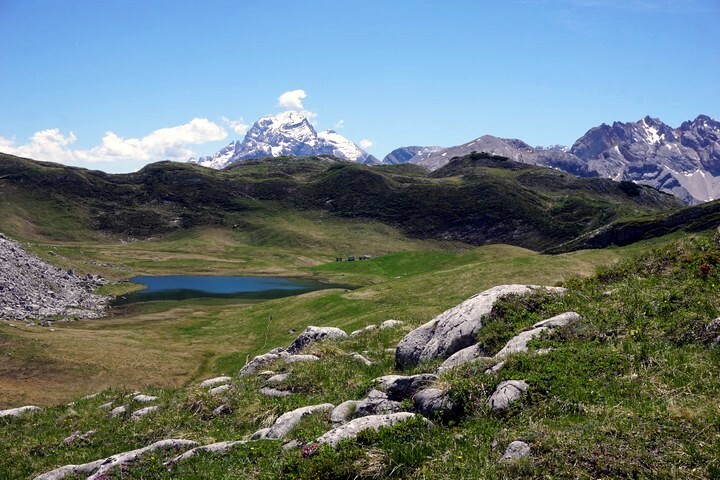 This impressive mountain group is home to a number of sheer, towering peaks, including more than 18 that rise over 3,000 meters, with the highest being Marmolada, standing 3,343 m above sea level. Throughout centuries, the mountains – formed by pale dolomitic limestone – were eroded. Jagged peaks, sheer cliffs, massive rock faces and deep, narrow valleys are common throughout, widely regarded as being one of the most spectacular mountain landscapes in the world. Spanning 141,903 ha the Dolomites were named a UNESCO World Heritage Site in 2009 for both their beauty and earth-science value. The high variety and concentration of limestone formations in one area is unique to this mountain range and the exposed geography provides scientists and visitors alike a small glimpse into the marine life in the Triassic period. There are more than enough ways to explore the area. In the summer you can hike, climb, hang-glide or cycle. When the snow falls you can ski, snowboard, etc. 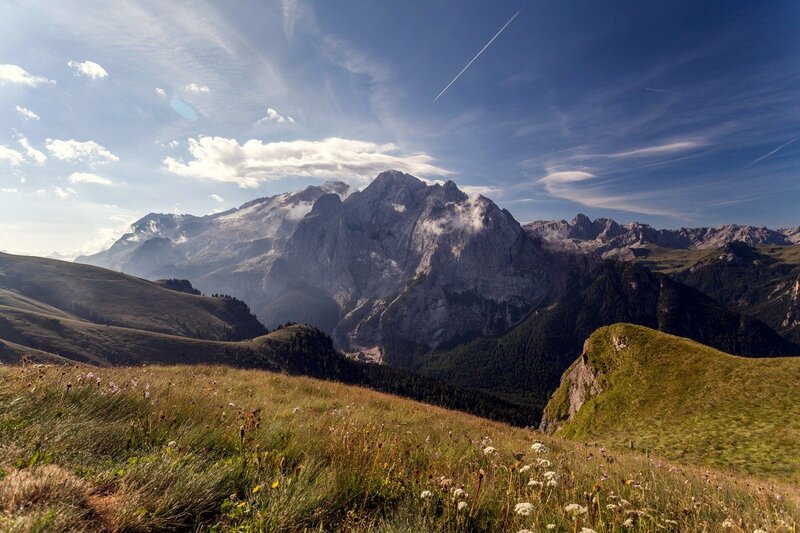 Since the first explorers set foot on the Dolomites in the mid-1800s, it has become a popular tourist destination – promising adventure and discovery around every corner. The most important route in the area is the A22, the main north-south highway that connects Italy with Central Europe. Here you can connect with the Austrian city of Innsbruck with notable cities on the Italian side including Bressanone, Bolzano, Trento and Rovereto. 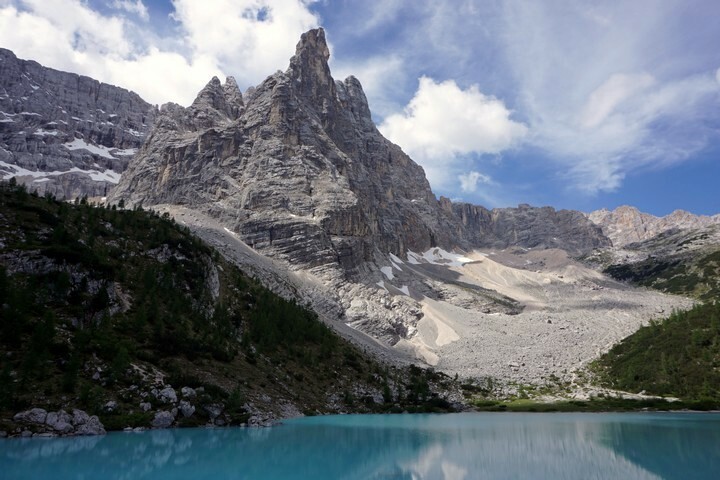 Here we’ll take you through the basic overview of hiking in the Italian Dolomites – including how to get there, where to stay, where to eat, what to see and what to watch out for. There are several airport options available to you. The Bolzano Airport (BZO) is essentially located in the heart of the Dolomites, providing the most direct access to the region. It may be difficult to find flights here, however, as it typically serves only national flights (if you fly from Rome, for example). We suggest flying into one of the larger airports such as Milan Linate (LIN) or Venice Marco Polo (VCE) in Italy. As well, it could be even cheaper to fly into Munich Airport (MUC) and rent a car from there. It’s typically less expensive than in Italy. Also keep in mind that Milan Bergamo Airport (BGO) is the base for the low-cost airline Ryanair in Italy. You can find many cheap flights to here from cities throughout Europe. We suggest looking through the many options, keeping in mind which method of transit you plan to use once in the Dolomites (i.e.  renting a car or taking public transport). There’s really never a bad time to visit the Dolomites, with each season bringing its own special benefits. During the winter season the spectacular peaks provide excellent terrain for skiing, snowboarding, snowshoeing and more! The region is home to one of the world’s top ski resorts, famously hosting the 1956 Winter Olympics in Cortina. The sun shines on average eight out of every ten days – more than any other range in the Alps. Did we mention the Christmas markets? If you prefer to wait until the snow melts, the other seasons have lots to offer in the Dolomites. Once spring arrives the mountains shed their snowy layers and reveal the light color of the limestone once again. Hiking and cycling trails open up, and against the backdrop of wildflower-clad meadows and rolling green fields, the scenery is spectacular. As summer rolls in all manner of adventuring routes – including trails, climbing and the via ferrata – are open, as well as the numerous rifugi (mountain huts) which provide a place to sleep along the hiking paths. There are also a number of music festivals during this time throughout the region, but it’s also the most crowded time of year! In the fall, crowds begin to disperse, and you can be sure to have increased solitude to admire the wonderful landscape. As the larch trees turn to a stunning golden hue, the mountain air turns crisp and fresh. The easiest and most convenient way to get around in the Dolomites is by private vehicle. With this option you have the flexibility to travel from place to place with ease, enjoying the spectacular landscape and scenery at your leisure. If you do rent a car, however, pay close attention to traffic signals (violations are recorded on video along the road and you might just receive a ticket sent to your home address). As well, take extreme caution on winding mountain roads. Sudden road closures due to weather is common in winter. Bus and train services also run from the larger cities – Verona, Venice, and Milan – to the alpine villages that provide access to the trails. To reach the most remote areas, you’ll need to find a bus, as trains are mostly based along the larger cities and towns. For more information about buses consult any of the following services: Dolomiti Bus, ATVO, Cortina Express, Trentino Transporti or Südtirol Mobile. For train information consult the TrenItalia website. 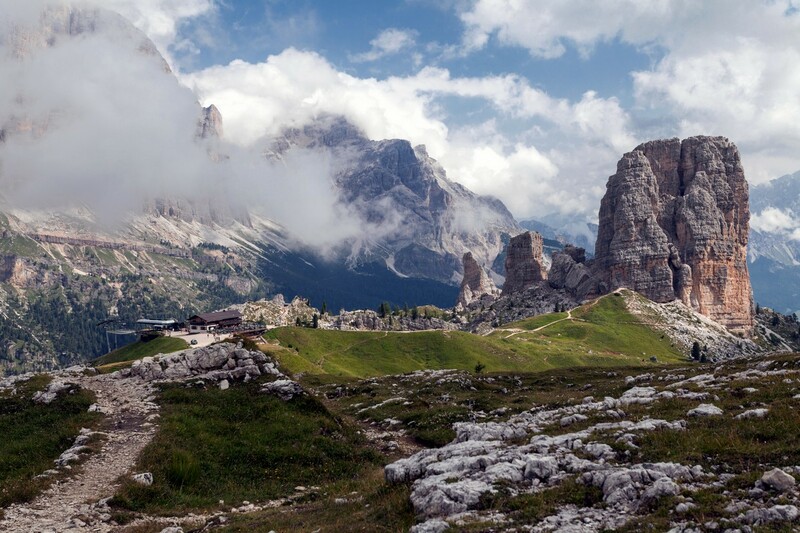 Accommodations in the Dolomites range from chic, classic options (renovated chalets, 19th century hotels and stately castles) to the rustic rifugi (mountain huts) along the trails that are typically only open during the warmer months. Interspersed between these options, you’ll find a number of budget-friendly bed and breakfasts in the smaller villages. If you plan to go during the winter, you’ll most likely need to book a ski vacation as a package deal with the hotel included. During the high season (summer and winter) make sure to plan ahead and reserve your lodging early. We suggest first deciding which area of the Dolomites you want to stay in and then searching for accommodation from there. Our favorite bases are Cortina d’Ampezzo, the Badia Valley, and the Gardena Valley, especially Ortisei. Cortina d’Ampezzo is in the heart of the southern Dolomitic Alps. The town swells from 7,000 to 40,000 in the winter months with the influx of mountain-crazed tourists. The town also hosted the 1956 Winter Olympics. That said, there are many great little villages scattered about this stunning region. Such a prestigious region has many luxurious hotels, but none as grand as the Cristallo. These rooms are lavish and regal. They look like they frequently host royalty. There’s a spa, pool and everything you could dream for. Hotel Natale is our favourite three-star hotel in the area. The rooms have that pine look that are synonymous with the Alps. There’s a spa in the hotel as well. For a smaller accommodation try the Caldara B&B. Ronny and Simonetta are fantastic hosts. 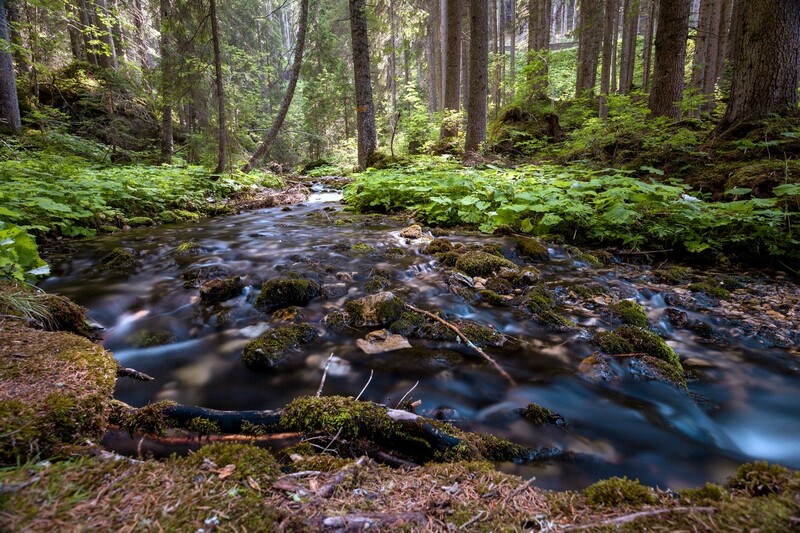 It’s only ten minutes from the center of Cortina and the lodge is very eco-friendly. The Badia Valley or, the Val Badia as its known, has been carved by the Gran Ega river in South Tyrol. Badia and Corvara are the two largest communes in the Badia Valley. It’s also important to note that the citizens in this valley speak the Ladin language (not Latin). Ladin is a romance language that is only really spoken in five valleys. Hotel Cavallino is a small, family-owned hotel in Badia. They offer bed and breakfast, there’s a small spa service, and a great restaurant. It’s not overly pricey especially considering the size of the rooms! It’s a great value. Hotel La Muda typically has an even lower price point. There aren’t the same spa services available, but the restaurant is still quite good. The rooms are also not as new, but everything is still well-kept. The Miraval Natur Hotel is beautiful as well (isn’t everything in this region?). Their lobby space, which is showcased on their website, is breathtaking. You can rent one of twelve rooms or one of seven apartments (which is great because you have the freedom to prepare your own meals). Another Ladin speaking valleys is Val Gardena. The main river running through the valley is the Derjon, and the main villages are Ortisei, Selva, and Santa Cristina. The valley is known for skiing, rock climbing, hiking, and charming wood carvings. To start with Ortisei, there are two great options that include breakfast. Garni Irma B&B is the first recommendation in Ortisei. They are just a short walk to the funicular Resciesa and they’re only five minutes from town. The price is low, and the rooms are clean and simple. What’d great about Garni Irma is that each room has big sunny balconies with views of the Dolomites. The other great B&B is Hotel Garni Snaltnerhof. This is yet another well-priced hotel (although it’s slightly more expensive than Garni Irma), and it’s in an even better location. Our favourite luxury option in Val Gardena is Hotel Laurin in Selva. The look is very modern, but there are subtle call-backs to the regions historical aesthetic. There’s a sauna and swimming pool too. The Castel Pergine is a great countryside option situated in the heart of the mountain range roughly 20km outside of Trento. This 13th century castle has been restored into twenty hotel rooms spread across three towers. Once home to Trento’s prince-bishops in the 16th century, the castle has since been restored offering guests a rustic stay in a spectacular location. For something a bit more luxurious, with instant access to hiking and ski trails, check out the Alpine Wellness Resort Majestic. Located right in front of the Plan de Corones in Brunico, the resort features décor typical of the region, food included with your stay, an expansive spa and wellness center, and guided hiking tours. For those looking for a pure hiking experience, the rifugi (mountain huts) are the way to go. Most huts along the hiking trails are run by the Club Alpino Italiano. You can typically find information about each location and make a reservation either on their website or at a local tourist office. 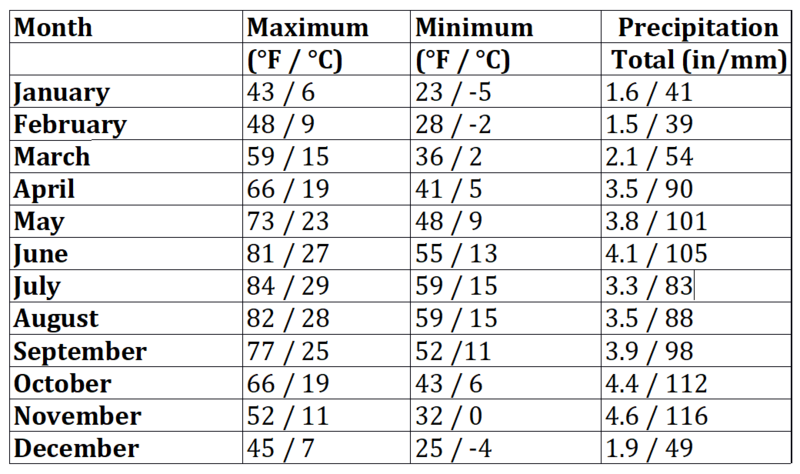 There is also no tenting allowed in the region. As with accommodation, the Dolomites offer visitors a vast selection of eating options. Don’t expect pure pizza and pasta here, however – it’s clear from the first menu glance that the Austrian influence is firmly cemented itself in the culture and restaurants. Expect a mix of Italian and Austro-Germanic dishes such as a variety of sausages, spätzle (similar to pasta but much thicker in texture), as well as fresh meats, cheeses and produce from neighboring farms. You may also find that most restaurants also either produce their own crops and livestock or work closely with food producers in the area. For a combination eat and stay, check out the Ütia de Börz. They have spectacular views of the Sas de Pütia peak as well as homemade speck (traditional dish from the region, similar to bacon, but much thicker) and buttered dumplings. Pretzhof located on the hilltops of Tulve is another great option. There is no menu – rather the chefs prepare dishes based on what is fresh on their farm, including delicious meats and an extensive wine cellar. 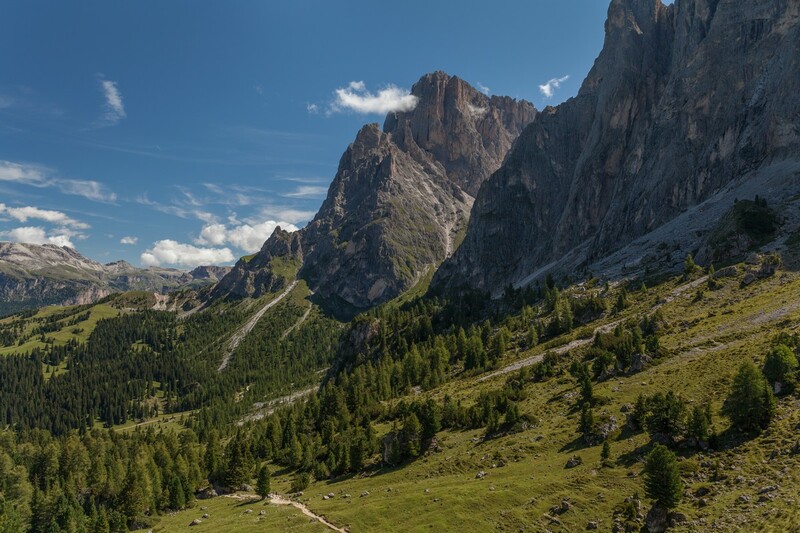 While in the Badia Valley head to Tana dell’Orso. This is the place to go if you want real local cuisine without panache. The atmosphere is very kitschy. There are stuffed bears and witches lining the ceiling. The roof is low, and everything is wooden. It’s the kind of place you go to for a filling meal after a long day of hiking. It’s loads of fun. If you need something quick in the morning, before you go out for a hike, check out I Dolci Di Ricky. The pastries are great, but we also love their homemade granola bars. There’s no better mid-hike snack! If you find yourself in the upscale village of Cortina d’Ampezzo, make sure to check out Aga, a restaurant featuring fiercely local dishes using produce either grown in the local garden or collected from the surrounding hills. We also really liked Ristorante Al Camin Cortina. Like Aga, they keep things locally sourced, Al Camin, however, then puts a spin on the traditional dishes. Their fusion fine dining is worth a stop. If you want something simpler in Cortina d’Ampezzo try Birreria Hacker Pschorr. It’s a simple beer house with easy, cheap eats and a good tap list. It’s perfect for some après hike or ski. And, for an old restaurant with a very compelling atmosphere, check out Ristorante Ospitale. It falls into our mid-range price point and it’s just flush with history. It’s on walking route 208 if you’re in the area. In the beautiful town of Ortisei good food surrounds you constantly. It’s hard to make a bad choice. Our fine dining location of choice is Tubladel. As with many fine dining experiences in the Alps, there is a playful dichotomy between the rustic, alpine, wood interior and the upscale creative plating. Everything we’ve had there has been fantastic. If you ever see burrata (a soft fresh cheese) on their menu, order it. The Sofie Baita Hutte is a great place to go year-round. Located on Monte Seceda, the views from this mid-range bistro are breathtaking. It’s great to plan a hike just before dining here. It makes for a great reward. Café Demetz is the best little café in Ortisei. Their pastries are amazing and so is their homemade ice cream. You can also get hot sandwiches to go if you like. They’re open all day, so we like stopping in for breakfast or to tide us over before a late-night dinner. Our favorite meal in all of the Dolomites was quite special. Perched on a mountaintop, in the Rifugio Lagazuoi, we found the most perfect strudel in the world. This rifugio sits on the Falzragado pass, and as we looked across the mountaintops, we savored this combination of strudel, espresso, and breathtaking location. We cannot recommend it enough. It is bucket-list-level strudel. 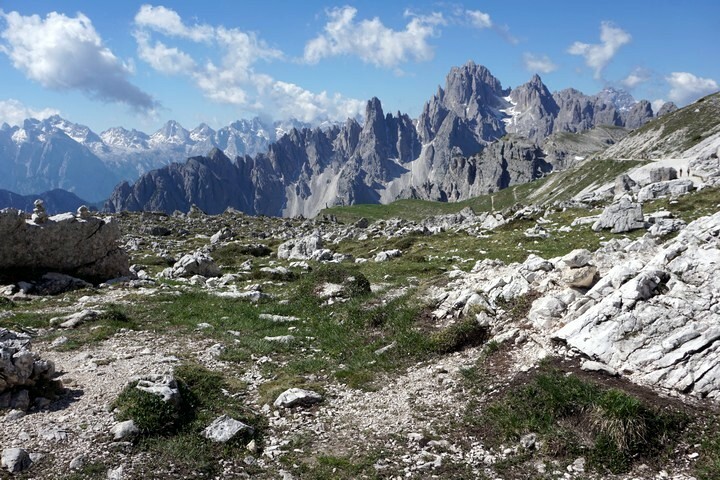 WHAT ELSE CAN YOU DO BESIDES HIKING IN the Italian Dolomites? The Dolomites offer so much to do, that it’s easy to spend a season here and still explore new things all the time. While the landscape is what draws most visitors, the Dolomites also offer a wide variety of activities – both indoors and out. The area has a rich history, and castles, chalets and museums can be found seemingly around every corner. Obviously in winter there is incredible skiing throughout the region. Some of the most legendary ski areas on earth are here. 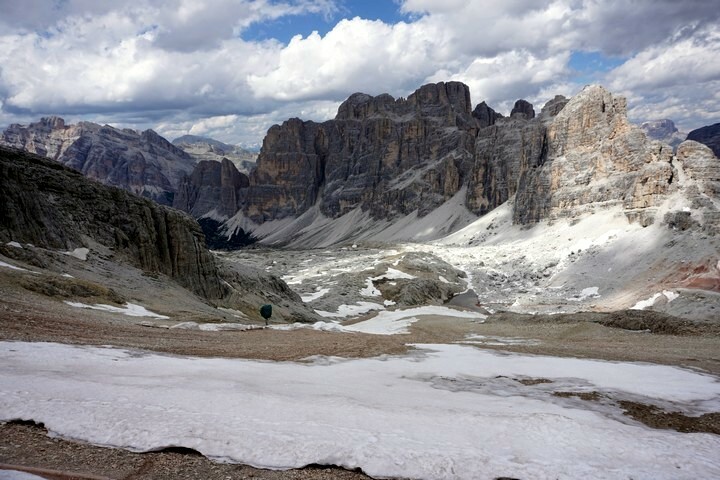 We are particularly fond of skiing around Cortina as well as in the Val Gardena Valley. The scenery in the Dolomites seems more epic than other places in the Alps. Winter also sees options for snow-shoeing and cross-country skiing. Summer is great for hiking, trekking, mountain biking and climbing. The roads are also full of road cyclists, trying to get over the high, beautiful passes. We recommend all of these, although road bikers will need a head for traffic, as the roads are narrow and crowded. Go ahead and adventure out on your own to explore the extensive trails or hire a guided tour such as Dolomite Biking. The Museo Archeologico Dell’alto Adige, for example, should not be missed. This archeological museum features Ötzi, a more than 5,300-year-old iceman discovered deep in ice and snow nearly 30 years ago. The mummy, his clothing and equipment were all well preserved in the fierce cold and are now all on display at the museum. And not to worry, if your feet need a rest you can still explore the awe-inspiring landscape – from a cable car, of course! Routes run from many of the main areas with the Dolomites. In Bolzano, for example, you can find a number of cable car routes. In addition, if you’ve got a private car at your disposal, we recommend taking a drive on the Great Dolomites Road. Connecting Bozen and Bolzano, this route crosses through a number of scenic points including Falzarego, Pordoi and Karerpass. Weather can change quickly in the mountains. Watch out for lighting storms and snow. Pay attention on trails, the cliffs can be very steep, and people have fallen off before. Sometimes it feels like driving around the Dolomites is the most dangerous part. With stunning, narrow roads surrounded by some of the best mountain scenery on earth, many people end up not paying enough attention. Make sure to book ahead during the high season. It can get very pricey – even for the most rustic accommodation. Staff at the lodging and restaurants may speak English, but Italian and German are the preferred languages. Make sure you check seasonal availability ahead of time because many places may be closed in the winter.